While the Kentucky Derby may have passed, there’s no time like the present to enjoy one of the sport’s most deliciously iconic, refreshing drinks: the mint julep. Especially when the present—May 30—is Mint Julep Day. To celebrate the holiday, we’ve compiled tips, tricks and recipes from bartenders across the country, including the mint julep’s home state of Kentucky. 1. DON'T OVER-MUDDLE THE MINT. Muddling is one of the most important steps in the mint julep process, according to James Bolt, beverage director and bar manager at The Gin Joint in Charleston, South Carolina. But don’t just start pounding away; first, you must understand the process. The mint julep is as much about flavor as it is smell. To capitalize on the mint’s inherently strong scent, Bolt suggests placing your head as close to the straw as possible to soak up the aromas. 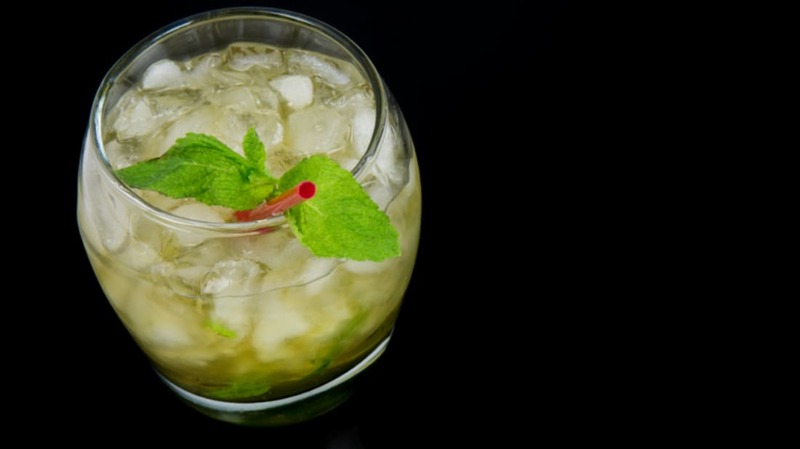 Cincinnati’s most respected mixologist, Molly Wellmann, also recommends placing the straw directly down the middle of the mint sprig to further excite the senses. Take the sensory overload one tasteful step further by rubbing the glass with mint leaves prior to pouring the drink. This trick belongs to Keri Smith, head bartender at Doc Crow’s Southern Smokehouse & Raw Bar in Louisville, Kentucky. By rubbing the glass, the mint’s oils last longer, adding that strong, minty aroma to each and every sip. 4. USE FRESH, CRUSHED ICE. While ice is usually an afterthought, it’s of utmost importance when it comes to the mint julep. Pros like Bolt and Wellmann opt for freshly crushed ice rather than the standard cubed variety, but rest assured: Even if you don’t have a fancy ice-crushing machine, you can still make a mean mint julep. 5. “EXPERI-MINT” WITH ALTERNATIVE INGREDIENTS. Sure, the drink’s called a mint julep, but you don’t have to stick solely to mint. Smith has a number of unconventional mint julep concoctions at Doc Crow’s, such as a mint julep lemonade and a Near Easter Julep that substitutes basil for mint, and includes ginger for warmth and spice. 6. BRING OUT THE BIG BOURBONS. A high-class drink deserves high-quality liquor. Fred Minnick, the Kentucky Derby Museum’s bourbon authority and drinks historian, suggests using high-proof bourbons that “will stand up to the ice and stick out.” His favorites are Baker’s Bourbon, a seven-year-old, 107-proof whiskey from Jim Beam, or 107-proof Old Weller Antique, the only accessible wheated bourbon that can handle the mint julep’s ice. 7. ADD A SPLASH OF RUM. Why should bourbon have all the fun? Wellmann likes to spice things up, topping off her mint juleps with a little dark rum to bring out the drink’s caramel and vanilla notes. As you prepare your own concoctions to celebrate today’s national holiday, here are two recipes to get you well on your way to mint julep perfection. Add the mint leaves to a Julep tin and gently muddle to extract essential oils. Then add the Demerara syrup, bourbon and Angostura bitters. Fill the julep tin with crushed ice and shape in to a snow cone of ice on top. Gently garnish with slapped mint and a straw. In a double old fashioned glass, rub basil leaves along inside. Add ingredients to glass. Fill glass with crushed ice, swizzle with bar spoon for five seconds. Garnish with slapped basil leaf.